NCI (Non-Covalent Interactions) is a visualization index based on the density and its derivatives. 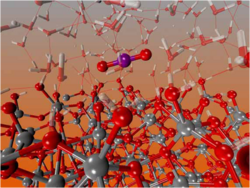 It enables identification of non-covalent interactions. NCIPLOT is available for download. Erin R. Johnson, Shahar Keinan, Paula Mori-Sanchez, Julia Contreras-Garcia, Aron J. Cohen, and Weitao Yang, J. Am. Chem. Soc. 2010, 132, pp 6498-6506. J. Contreras-Garcia, E. R. Johnson, S. Keinan, R. Chaudret, J-P. Piquemal, D. N. Beratan, and W. Yang. J. Chem. Theory Comput. 2011, 7, pp 625-632. The NEWLEAD program: a new method for the design of candidate structures from pharmacophoric hypotheses. J Med Chem. 1993 Nov 26;36(24):3863-70. Unique Identifier : AIDSLINE MED/94076288 Tschinke V; Cohen NC; Research Department, Pharmaceuticals Division, CIBA-GEIGY; Limited, Basel, Switzerland. 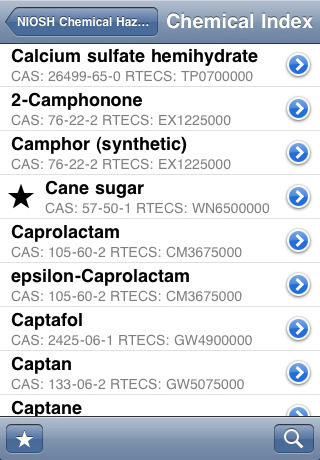 The NIOSH Chemical Hazards application is an iPhone implementation of the NIOSH Pocket Guide to Chemical Safety. In addition to the complete contents of the pocket guide it includes the following enhanced functionality: - Searchable index of Chemical Names, Synonyms and Trade Names. nMOLDYN is an interactive analysis program for Molecular Dynamics simulations. It is especially designed for the computation and decomposition of neutron scattering spectra, but also computes other quantities. NMRtec have an NMRnotebook, is a new NMR software package for processing, analysing and managing NMR data. It is especially designed for chemists, biochemists and spectroscopists dealing with NMR. It allows you to perform state of the art 1D and 2D NMR data processing by just a few mouse clicks. NMRPipe provides comprehensive facilities for Fourier processing of spectra in one to four dimensions, as well as a variety of facilities for spectral display and analysis. It is currently used in over 300 academic and commercial laboratories. 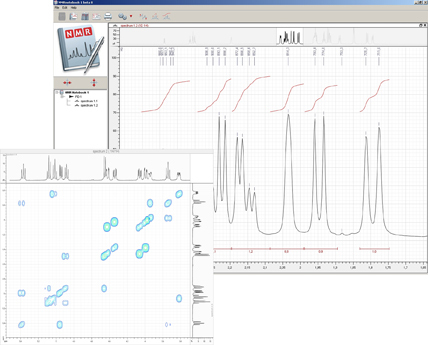 NMRViewJ software for the visualisation and analysis of NMR data. NWChem is a computational chemistry package that is designed to run on high-performance parallel supercomputers as well as conventional workstation clusters. It aims to be scalable both in its ability to treat large problems efficiently, and in its usage of available parallel computing resources. NWChem has been developed by the Molecular Sciences Software group of the Environmental Molecular Sciences Laboratory (EMSL) at the Pacific Northwest National Laboratory (PNNL). Designed for use with the large libraries required for computer-aided drug design, OMEGA generates multi-conformer structure databases with unprecedented speed and reliability. Conformational expansion of drug-like molecules can be performed in fractions of a second, yielding a throughput of hundreds of thousands of compounds per processor per day. Scientists at AstraZeneca found OMEGA to be more reliable in reproducing crystal structures than programs taking orders of magnitude more time. Researchers at Vertex concluded, "Omega achieves the best balance between speed and performance among the programs examined, and it appears to be the most suitable tool for conformational analysis on large chemical databases." There is a publication describing the validation here. OnScreen DNA™ is geared towards, but not restricted to, high school and college students and teachers. The program has been designed, first of all, to allow students to become completely at home with the essential details of DNA's three-dimensional double helix structure. Open3DALIGN is a command-line tool which is operated by means of a few commands which can be entered interactively from a command prompt, read from a batch script or piped through standard input. If PyMOL is installed on the system while Open3DALIGN is being operated interactively, the setup of alignments can be followed in real time on PyMOL's viewport. Open3DGRID is an open-source software aimed at high-throughput generation of molecular interaction fields (MIFs). Open3DGRID can generate steric potential, electron density and MM/QM electrostatic potential fields; furthermore, it can import GRIDKONT binary files produced by GRID and CoMFA/CoMSIA fields (exported from SYBYL with the aid of a small SPL script). Open3DQSAR:- High-throughput analysis of molecular interaction fields. Open3DQSAR is an open-source tool aimed at pharmacophore exploration by high-throughput chemometric analysis of molecular interaction fields (MIFs). Open3DQSAR can generate steric potential, electron density and MM/QM electrostatic potential fields. OpenDX is a uniquely powerful, full-featured open source software package for the visualization of scientific, engineering and analytical data. Downloadable binaries are available from VIS Inc.
open enventory :- an integrated laboratory journal with a literature database and inventory program. open enventory is an integrated laboratory journal with a literature database and inventory program. It is a web application (Internet Explorer 7, Firefox 3.5, Opera 9.52, Apple Safari, Google Chrome) and therefore platform independent (find technical information here). The integration makes physical data and safety informationen from the inventory automatically accessible in the laboratory journal. The automatic acquisition of freely accessible data from online databases makes manual data acquisition and catalogue searches obsolete. Accessing the online catalogues also allows price surveys with a mouseclick. 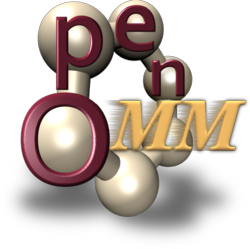 OpenMD is an open source molecular dynamics engine which is capable of efficiently simulating liquids, proteins, nanoparticles, interfaces, and other complex systems using atom types with orientational degrees of freedom (e.g. “sticky” atoms, point dipoles, and coarse-grained assemblies). Proteins, zeolites, lipids, transition metals (bulk, flat interfaces, and nanoparticles) have all been simulated using force fields included with the code. OpenMD works on parallel computers using the Message Passing Interface (MPI), and comes with a number of analysis and utility programs that are easy to use and modify. 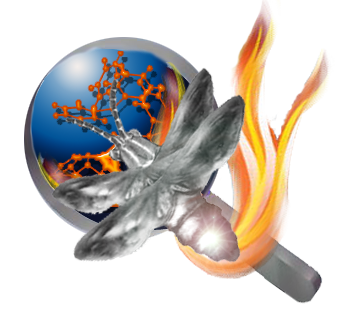 OpenMM is a library which provides tools for modern molecular modeling simulation. As a library it can be hooked into any code, allowing that code to do molecular modeling with minimal extra coding. Moreover, OpenMM has a strong emphasis on hardware acceleration, thus providing not just a consistent API, but much greater performance than what one could get from just about any other code available. - Amber/Sander interface for OpenMM (http://simtk.org/home/sander_openmm): These extensions to the Amber software allow Amber users to use OpenMM to run accelerated MD simulations using existing (Sander) input files. OpenMM Zephyr is a molecular simulation application for studying molecular dynamics of proteins, RNA, and other molecules. Zephyr guides the user through a work flow for setting up and running a specialized version of the molecular dynamics application gromacs. This version of gromacs uses the OpenMM API for GPU-accelerated molecular simulations. 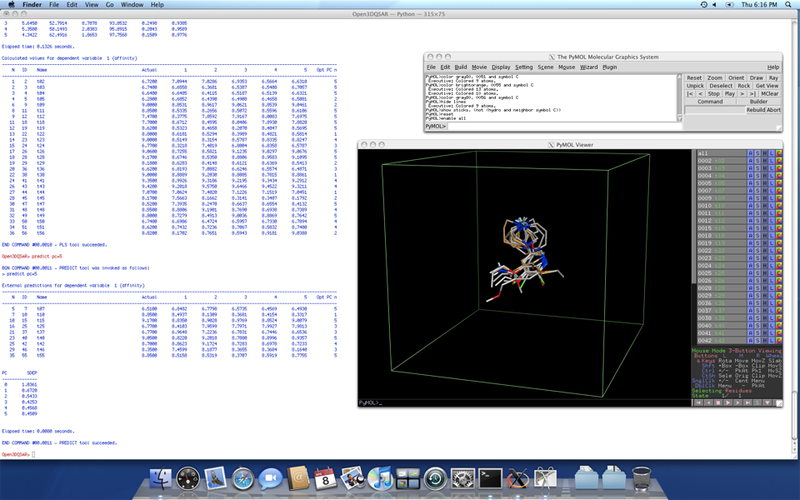 Graphical user interface for running OpenMM version of Gromacs. To use Zephyr's visualization capabilities, you will also need to install VMD (optional but recommended). Orbdraw is a visualization program for displaying molecular orbital and electron density data from Gaussian, Gamess, Jaguar, Hondo, Mopac or Ampac calculations. Orbdraw can display the molecular orbitals, electron densities or spin densities in 3D as either wire frames or solid surfaces and can map orbitals or charges onto the density surfaces. The images can be rotated about any axis. The user may select which orbital to display, the resolution, the threshold value and the type of display. The orbitals are displayed over the molecular structure and the structure can be displayed as either a stick figure or with tubular bonds. The graphics images can be saved in several different graphics formats, and input files for PovRay (www.povray.org) can be generated. ORCA is a flexible, efficient and easy-to-use general purpose tool for quantum chemistry with specific emphasis on spectroscopic properties of open-shell molecules. It features a wide variety of standard quantum chemical methods ranging from semiempirical methods to DFT to single- and multireference correlated ab initio methods. It can also treat environmental and relativistic effects. Due to the user-friendly style, ORCA is considered to be a helpful tool not only for computational chemists, but also for chemists, physicists and biologists that are interested in developing the full information content of their experimental data with help of calculations. 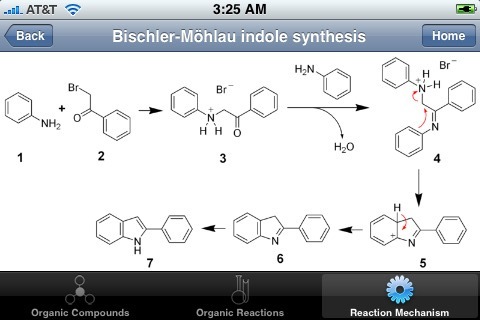 Organic Chemistry Express is an iPhone Organic Chemistry Reference. OSRA is a utility designed to convert graphical representations of chemical structures, as they appear in journal articles, patent documents, textbooks, trade magazines etc., into SMILES (Simplified Molecular Input Line Entry Specification - see http://en.wikipedia.org/wiki/SMILES) or SD file - a computer recognizable molecular structure format. OSRA can read a document in any of the over 90 graphical formats parseable by ImageMagick. PaDel-Descriptor is software to calculate molecular descriptors and fingerprints. The software currently calculates 797 descriptors (663 1D, 2D descriptors and 134 3D descriptors) and 10 types of fingerprints. The descriptors and fingerprints are calculated using The Chemistry Development Kit with some additional descriptors and fingerprints. These additions include atom type electrotopological state descriptors, McGowan volume, molecular linear free energy relation descriptors, ring counts, count of chemical substructures identified by Laggner, and binary fingerprints and count of chemical substructures identified by Klekota and Roth. Parallel Quantum Solutions We estimate that well over 80% of CPU cycles spent in ab initio computations are used in optimizing geometries at the SCF or DFT levels,and in computing molecular properties, such as vibrational frequencies and NMR chemical shifts. Such calculations are extremely well suited for parallel implementation. Shifting them to an inexpensive and fast parallel machine can free up expensive workstations for more demanding calculations. Partek A leading provider of pattern recognition software, data mining and interactive visualisation tools plan to support Mac OSX. As of February 23, 2009, the PC GAMESSFirefly team is proud to announce the availability of the first official release of the PC GAMESS/Firefly package for Mac OS X/Intel platform. Free and fast! Proven reliability and performance of Windows/Linux PC GAMESS/Firefly. Feature rich - supports all the functionality of Windows/Linux-based PC GAMESS/Firefly. Runs on Mac OS X 10.4.x (Tiger) and 10.5.x (Leopard). Parallel jobs run on SMP/multi-core hardware without additional software. Installation is straightforward with a native DMG installer. New drag and drop job submission applications make running jobs significantly easier and more intuitive than most other ab-initio computational chemistry programs on the Mac platform. Just drag and drop your input file on to the appropriate run application for the number of CPU cores desired (or double-click and select) and your job will simply launch and open the output in a suitable text editor. All the necessary output files that may be needed for future follow-up jobs are automatically delivered to the input file directory. Everything is intended to be Mac friendly including a set of Mac-specific step by step Quick Start and Complete install and usage guides that should cover 90%+ of all potential questions for new users. A batch job submission application and a STOP-FIREFLY-JOBS application which allows multiple job management. A good set of third-party Mac native graphical applications is available to prepare input jobs as well as to visualize the output of those runs (e.g., WebMO). Most visualization tools that are not available natively for Mac work fine through Darwine or Crossover Wine. There is an active community of Mac beta testers and Firefly community users to answer questions for new users. PCModel 9 is available for MacOSX, it is designed for research chemists build, minimise and manipulate multiple structures. A variety of forcefields are supported, conformational searching is biult in and there is an interface to Gaussian and Games. They also supply Orbdraw for displaying molecular orbitals and Vibrate for visualise normal vibrational modes. pDynamo:-an open source program library that has been designed for the simulation of molecular systems using quantum chemical (QC), molecular mechanical (MM) and hybrid QC/MM potential energy functions. pDynamo is an open source program library that has been designed for the simulation of molecular systems using quantum chemical (QC), molecular mechanical (MM) and hybrid QC/MM potential energy functions. pDynamo is written in a mixture of Python and C and complements the existing version of Dynamo, now denoted fDynamo, that is written in Fortrans 90 and 95. •	A density functional theory QC method employing Gaussian basis sets. •	Semi-empirical QC methods of the MNDO type, including AM1, MNDO, PDDG, PM3 and RM1. •	Support for some standard MM force fields, including AMBER, CHARMM and OPLS-AA. •	Hybrid QC/MM methods using any combination of the QC and MM potentials implemented in the library. •	Coupling to third-party QC programs. •	Property calculations, such as charges and dipoles. •	Various "soft" geometrical constraints. •	The ability to handle various common molecular file formats. Peacock is an application that can be used to interpret gas-chromatography/mass-spectrometry (GC/MS) data files. Here is a quick overview of what you can do with Peacock. 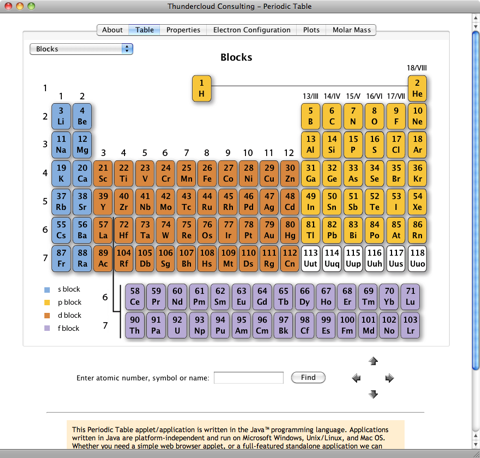 Periodic Table A user configurable Periodic Table. 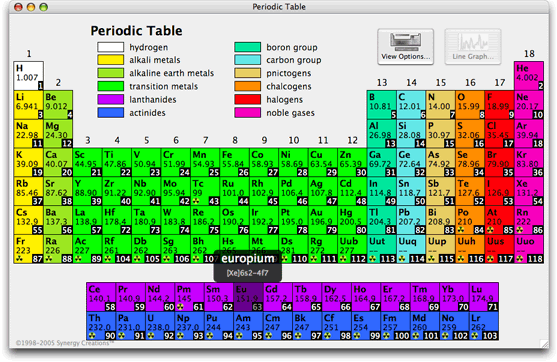 This interactive Periodic Table (application/applet) has been designed as a learning tool to help the beginning high school or undergraduate chemistry student gain insight. PerlMol is a collection of Perl modules for chemoinformatics and computational chemistry with the philosophy that "simple things should be simple". It should be possible to write one-liners that use this toolkit to do meaningful "molecular munging". The PerlMol toolkit provides objects and methods for representing molecules, atoms, and bonds in Perl; doing substructure matching; and reading and writing files in various formats. On Macintosh, either G5 PPC or Intel machines are supported, and require at least OS 10.4.11 (10.6.7 for the 64-bit version). Support for G5 systems may be dropped in the future. Additional information on Mac platform support is available here. It is of course worth bearing in mind how easy it is to set up small Mac clusters, Dauger Research provides a 3 step recipe for setting up a cluster using Pooch. POSIT is primarily based on the assumption that similar ligands bind similarly. Unlike most docking protocols, POSIT requires the presence of a known bound ligand. The bound ligand is used to impart docking constraints when placing and optimizing the geometry of the molecule being docked. PovChem is a chemical visualization and illustration program with a new graphic interface. It takes molecules in the PDB format, lets you to set up a picture with fine control over details of the illustration - colors, atom and bond radii, view orientation, etc. It will even calculate and display hydrogen bonds. It then exports the picture in POV-Ray format, which allows you to render the image with a state-of-the-art raytracer, giving high-quality images at any resolution, for anything from web page thumbnails to full-size high-resolution images for journal covers, advertisements, posters, anything! ProDy is a free and open-source Python package for protein structural dynamics analysis. It is designed as a flexible and responsive API suitable for interactive usage and application development. ProDy has fast and flexible PDB and DCD file parsers, and powerful and customizable atom selections for contact identification, structure comparisons, and rapid implementation of new methods. 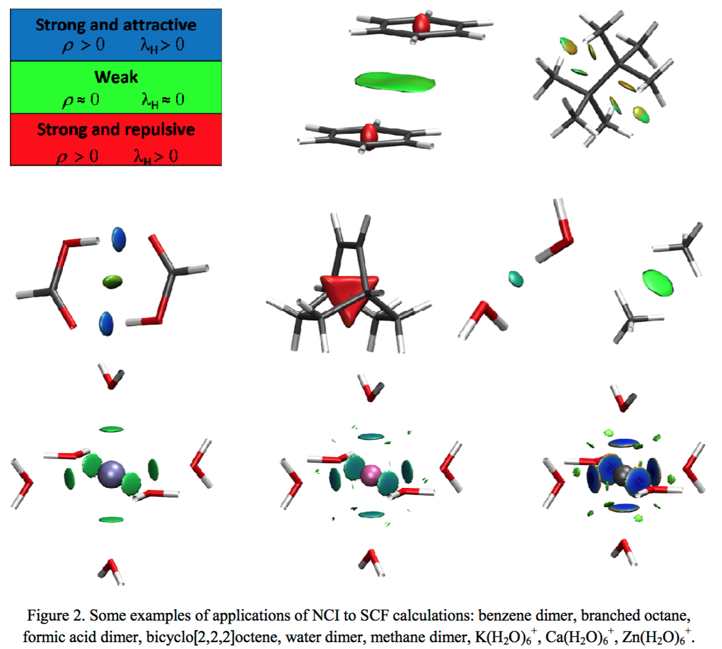 Coupled cluster methods including CC2, CCSD, CCSD(T), and CC3 with RHF, ROHF, UHF, and Brueckner orbitals. Determinant-based CI including CASSCF, RAS-CI, and Full CI. Multithreaded integral-direct SCF, MP2, and MP2-R12. Excited state methods: CIS, CIS(D), RPA, EOM-CCSD, and CC3. Analytic energy gradients for CCSD with RHF, ROHF, and UHF orbitals. Coupled cluster linear response methods for static and dynamic polarizabilities and optical rotation. Diagonal Born-Oppenheimer correction (DBOC) for RHF, ROHF, UHF, and CI wave functions. [PSI4](http://www.psicode.org) is in beta testing. PUPIL,Program for User Package Interface and Linking, is a software environment - the program - that allows developers to link quickly and efficiently together multiple pieces of software in a fully automated multi-scale simulation. More specifically, it supports QM/MM MD simulations where the user might choose among any of the different MD engines and QM engines, which are connected to PUPIL as external programs through a tiny specific interface. One of the main advantages here is that the user can use most of the functionalities that may have those external programs interfaced without the necessity to be implemented again on independent interfaces. In fact, this simulation interface concentrates all the common code involved in the coupling terms of the QM/MM approach. inner energy, enthalpy, Helmholtz free energy, Gibbs free energy, entropy, heat capacity at constant V and P, ideal heat capacity at constant P, speed of sound, isobaric expansion coefficient, relative pressure coefficient, isothermal compressibility, Joule Thompson coefficient, isentropic temperature-pressure coefficient, isothermal throttling coefficient, isothermal stress coefficient, second virial and third coefficient, fugacity and fugacity coefficient, compressibility factor. The program allows the calculation of the thermodynamic properties at arbitrary temperature and density or pressure conditions (List), tables with even spaced increments of temperature and density/volume (Table), or properties at the vapor saturation curve (Saturation). All these results are listed in Report tab which can be printed. The Plot tab allows the graphical representation of the thermodynamic properties for various conditions and includes the calculation of isopleths. These plots can be also printed. The Unit tab allows the user to choose the appropriate units for the individual thermodynamic properties. By default the thermodynamic values for the inner energy, the enthalpy, the entropy, the Helmholtz free energy, and the Gibbs free energy are calculated as reported by the respective EOS. If required, the values for these properties can be corrected for an ideal gas with H = 0 and S = 0 at respective reference conditions (typically 298.15 K and 0.1 MPa). The reference conditions, however, can be chosen by the user. PyMOL A 3D molecule viewer, PyMOL is a powerful molecular graphics package for structural biology and other sciences. This interactive system is fully scriptable using the Python computing language, sponsored and supported by users. The compiled PYMOL binaries are available for paid download with different options for academic, industrial and non-profit.